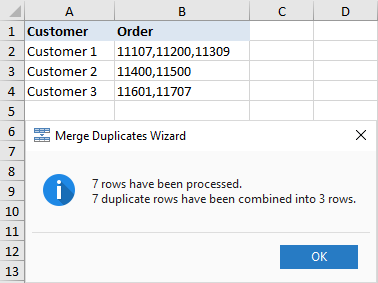 The tutorial shows how to safely merge rows in Excel in 4 different ways: merge multiple rows without losing data, combine duplicate rows, repeatedly merge blocks of rows, and copy matching rows from another table based on one or more common columns. "The selection contains multiple data values. Merging into one cell will keep the upper-left most data only." Clicking OK will merge the cells but only keep the value of the first cell, all other data will be gone. So, obviously we need a better solution. This article describes several methods that will let you merge multiple rows in Excel without losing any data. To joint the values from several cells into one, you can use either the CONCATENATE function or concatenation operator (&). Either way, you supply cells as references and type the desired delimiters in-between. Now you have several rows of data merged into one row. But your combined rows are formulas. To convert them to values, use the Paste Special feature as described in How to replace formulas with their values in Excel. 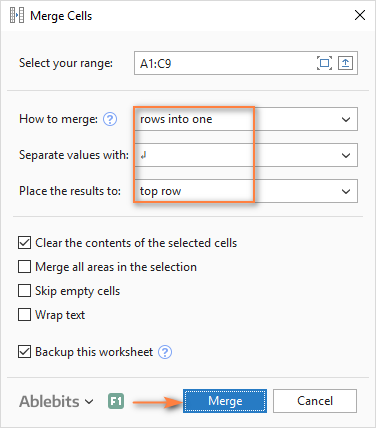 The Merge Cells add-in is a multi-purpose tool for joining cells in Excel that can merge individual cells as well as entire rows or columns. And most importantly, this tool keeps all the data even if the selection contains multiple values. Select the range of cells where you want to merge rows. 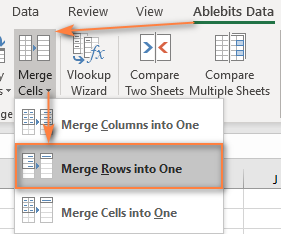 Go to the Ablebits Data tab > Merge group, click the Merge Cells arrow, and then click Merge Rows into One. The task: you have some Excel database with a few thousand entries. The values in one column are essentially the same while data in other columns are different. Your goal is to combine data from duplicate rows based on a certain column, making a comma separated list. Additionally, you may want to merge unique values only, omitting duplicates and skipping empty cells. The screenshot below shows what we are trying to achieve. The prospect of finding and merging duplicate rows manually is definitely something you'd want to avoid. Meet the Merge Duplicates add-in that turns this time-consuming and cumbersome chore into a quick 4-steps process. 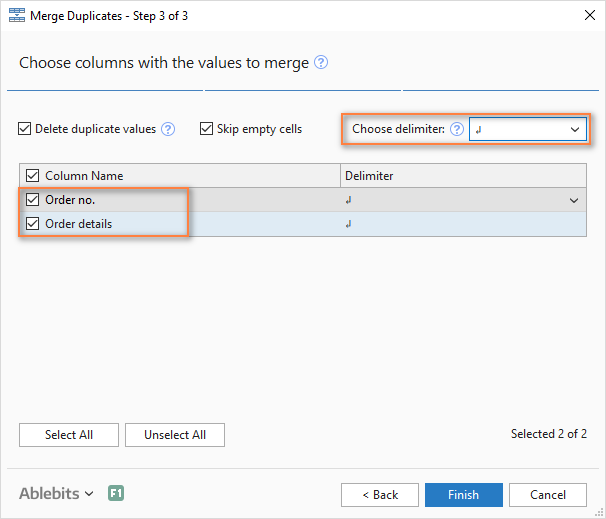 Select the duplicate rows you want to merge and run the Merge Duplicates wizard by clicking its button on the ribbon. Make sure your table is selected correctly and click Next. It is wise to keep the Create a backup copy option checked, especially if you are using the add-in for the first time. Select the key column to check for duplicates. In this example, we select the Customer column because we want to combine rows based on customer name. If you want to skip empty cells, be sure to select this option and click Next. Choose the columns to merge. In this step, you select the columns whose data you want to combine data and specify the delimiter: semicolon, comma, space, line break, etc. The task: you have an Excel file with information about the recent orders and each order takes 3 lines: product name, customer name and date of purchase. You would like to merge every three rows into one, i.e. repeatedly merge the blocks of three rows. Add a helper column to your worksheet, column C in our example. Let's name it BlockID, or whatever name you like. How this formula works: The ROW function extracts the row number of the formula cell, from which you subtract the number of the row where your data start, so that the formula starts counting from zero. For example, our data start in the 2nd row, so we subtract 2. If your data start, say, in row 5, then you will have ROW(C5)-5. After that, you divide the above equation by the number of rows to be merged and use the INT function to round the result down to the nearest integer. In step 2, choose BlockID as the key column. In step 3, select all the columns you want to merge and pick line break as the delimiter. Task: you have two tables with a common column(s) and you need to merge matching rows from those two tables. The tables may be located in the same sheet, in two different spreadsheets or in two different workbooks. For example, we have sales reports for January and February in two different worksheets and want to combine them into one. Mind you, each table may have a different number of rows and different order of products, therefore simple copy/pasting won't work. This will run the add-in with your main table preselected, so in the first step of the wizard you simply click Next. Select the second table, i.e. the lookup table containing the matching rows. Choose one or more column columns that exist in both tables. 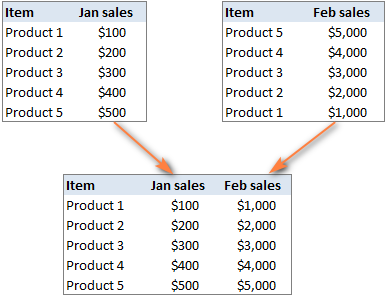 The key columns should contain only unique values, like Product ID in our example. Optionally, select the columns to update in the main table. In our case, there are no such columns, so we just click Next. Choose the columns to add to the main table, Feb sales in our case. How can I get these merging tools for Excel? All of the add-ins discussed in this tutorial, plus over 60 other time-saving tools, are included in our Ultimate Suite for Excel. The add-ins work with all versions of Excel 2019, Excel 2016, Excel 2013, Excel 2010 and Excel 2007. 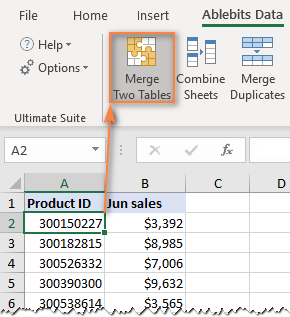 Hopefully, you can now merge rows in your Excel sheets exactly the way you want them. If you have not found a solution for your specific task, just leave a comment and we will try to figure out a way together. Thank you for reading! 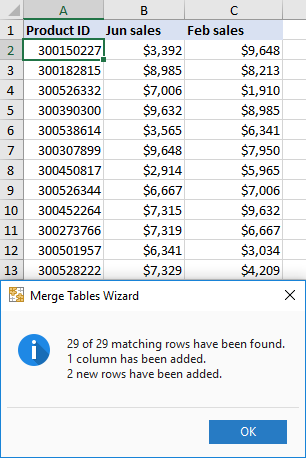 78 Responses to "How to merge rows in Excel without losing data"
You can find several solutions in this article: How to merge two columns in Excel without losing data. Hope you will find them helpful. Can I use this tool if I need to use the contents 2 columns ? 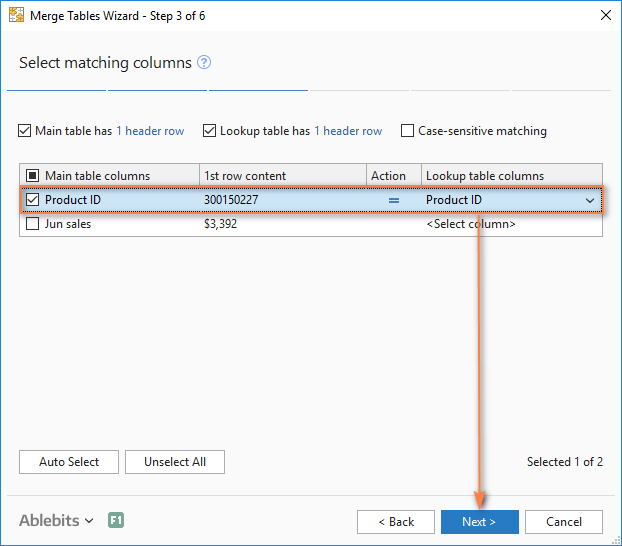 Of course, you can use one of the tools described in the article, Merge Cells add-in, to combine the contents of 2 columns. You can find the detailed description with screenshots here. Thank you for your interest in our merging add-in for Excel, I am really glad to know you like it! I'm afraid we cannot determine the exact cause of the problem without seeing your data. Can you please send me your workbook (or just a sample of data) at support@ablebits.com and describe the result you are trying to achieve? I will do my best to help. I can not find the menu and i want to help you on urgent basses so kindly help me. I am sorry, I do not exactly understand the problem. Do you mean you do not see the add-in's menu in Excel after installation? Anyway, you can reach our support team at support@ablebits.com and we will promptly respond and fix the issue. let's say I have 2 rows of the exact same data, except for ONE cell in each column. For an example, let's make the headers: a. Customer Name, b. Customer ID, c. Customer Address, and d. Amount Paid. Now rows 1 & 2 are the exact same customer, except in row 1 column d the dollar amount is $500, and in row 2 the dollar amount is $300. Is there a way to quickly consolidate into a single line, with the dollar amount in column d the sum of the previous entries? (i.e. $800)? 2. Using a pivot table. Thank you so much for this!! I was pulling my hair out trying to merge address data into one cell so that it would be more usable in a Mail merge in Microsoft Office. You saved my day!!! Thank you, thank you, thank you!!! I am having a 5000 customer in Column "A" and In column "A' most of the customer is repeated Now i want the formulas from which i will check the names of the customer which is present in this column. There exist a number of solutions depending on what exactly result you are trying to achieve. I am having the list as mentioned below and i want the result which is mentioned. please help by provinding the solution as mentioned in name coloum is change day by day i expecting the formula from where he automaticaly give me the result name of the customer which is present in name column. - Sort your table by the Name column. - Go to Data > Outline and click on Subtotal. - Click OK and then press Number 2 in the upper left-hand corner of your worksheet to get the sum by name. - Insert a pivot table (select your table and go to Insert > Tables > PivotTable). - Choose to insert the PivotTable report onto a new worksheet and click OK.
- In the PivotTable Fields pane, drag and drop the Names column to the Rows section and the Amount column to the Values section. - Go to Data > Remove duplicates to delete duplicated names. Where 'V3 - source'!A2:A18 is the reference to the Names column of your source data, 'V3 - source'!C2:C18 – the reference to the Amount column. Hi there, how to I undo the merged cells? It depends on how the cells were merged. If you have just merged them, you can use the standard Excel Undo feature (Ctrl+Z). Our merging add-ins create a backup copy of your worksheet before merging the data. In other cases, I'm afraid, Undo is not possible. When filling in the data, at times, the email is firstnamelastname@<email.com. I would like a way that when this is the case, I use a shortcut and firstnamelastname is automatically pasted in the 3rd column. Now this has to be a shortcut cause not always, this is the case. I hope you understood my query. Is this possible in any manner? If my understanding is correct, it is not possible to fulfill your task using formulas. Most likely you need a small VBA macro. I love the program, it is fantastic but I need to expand the results and not sure how to do that. 1 Run Combine Rows Wizard to merge the data and choose a semicolon as the separator. 3 Open the .csv file in Notepad and replace all semicolons with commas. Save the file. I want to merge the rows. but in the content some of the rows are blanks. i tried the concatenate formula like this(=A1&","A2) . Its not working. Tell me how to merge the rows with comma if there are blank rows inbetween the content. Sorry, I do not exactly understand the task. If you can send a sample workbook with your data to support@ablebits.com and include the result you want to get, our support team will try to help. Is there any formula to merge multiple empty cells in a column? Am not sure what I need is covered? I have two equal length adjacent columns, both containing text. I need to merge the text in column 1 with the text in column 2, into a single column (say 3) with no loss of data. I have a very lengthy spreadsheet, and I need to sort everything into alphabetical order by name in column "A", but each cell in column "A" has specific data in columns "B" thru "G" linked to it. Is there a way I can sort alphabetically without mixing up all the other data. My only thought was to merge each row entirely, and then sort via alphabetical order than un-merge all rows. Is there an easier way? I tried INT((ROW(C2)-2/3)) to combine multiple rows in my spreadsheet and I did get a value of 1 for C2, but I cannot find the block id or combine row wizard in Excel 2007. I have an online order system that gives me an excel sheet of individual items placed in an order. I want to merge the items and quantity based on each order. Is this possible with your program? How do you link an excel populated data sheet(A) to another data sheet(B) but manage to keep the information lock to dates when data is combined in data sheet(B). I have an inventory report that shows the cost when we purchased items. It first lists the item number and description, and then on another line it shows the date, qty, cost. Some items have just one purchase date, ie one row, and others have up to 5 rows. The items with multiple rows have a subtotal, the ones with one row do not. I want to get the part number and description on the same line(s) as the purchase date information. How do I do that? cell A2 and B2 have the item# and description. Cell B3 C3, D3, E3 have the purchase date, item cost, and qty. and extended cost. But sometimes there will also be a Cell B4, C4, D4 and E4 with another purchase date, cost and qty. And then this would be followed with a subtotal of the qty and cost in row 5. I need to get the Item# and Description to show up on all the lines for that part. If your data are distorted, you’d better hire freelancers who sort your data manually or write a macro. I am sorry, it is difficult to recommend you something without seeing your data. For us to be able to assist you better, please post a small sample workbook with your data on our forums. Our support team will try to help. Firstly, great article and very well explained! Is there a way to write up a script or some way to reformat the data to get the format we want - which is the first example? Dear All, Am trying to merge multiple rows in a particular column without affecting the contents of other columns. Can anyone help me out on how to repeatedly merge blocks of uneven rows into one row. I have very large data with uneven blocks of row. Name	Reported Date+""	Summary*""	Notes""
I want to merge the Notes into one cell against the other contents of the first row. Bonjour! I hope you will be able to help me! I have an Excel sheet containing column A, listing natural medicinal substances. Then columns B to AA have headers indicating the possible medicinal uses of said substances. There are 26 uses and I put "X"s in the column(s) that correspond to each substance's uses. To make a long story short, at first I had one excel spreadsheet for each use of my substances, and I now want to combine all the data in one larger spreadsheet. BUT, since each substance has multiple uses, I end up with, for example, 4 rows for "Tansy" (Ex. A 21, 22, 23, 24), and in each row, an X appears in the column corresponding to one use of the herb (Ex:B:21, C:22, J:23 and Y:24). What I would like to do is to combine the 4 Tansy rows into one (ex. row 21), where I would have B:32, C:21, J:21 and Y:21. - Use the top check-box to select all columns with the uses on step 3, and select the options to "Delete duplicate values" and "Skip empty cells". As you have the same "X"s in all cells, it doesn't matter what delimiter you leave in the field. If you have any difficulties, please send a sample worksheet to support@ablebits.com, we'll do our best to assist you. Pls suggest how do I concatenate for 5000 cells ? I want to merge 3 cells into 2. Please tell me if it is possible. Could you please provide an example of the data you have in three cells and of what you want to get in two cells as a result? You can send a sample spreadsheet to support@ablebits.com. I've read the part "Repeatedly merge blocks of rows into one row"
How can you make it work if you don't have the first row in your example? !!!!! And I have only one column which I'd like to be merged this way: Merging 1-18, Merging 19-36, Merging 37-54. (and do not delete the text: "blablabla". So I'd like to merge every 18 rows. (and do not delete the text: "blablabla". Thank you for sending the example to us. 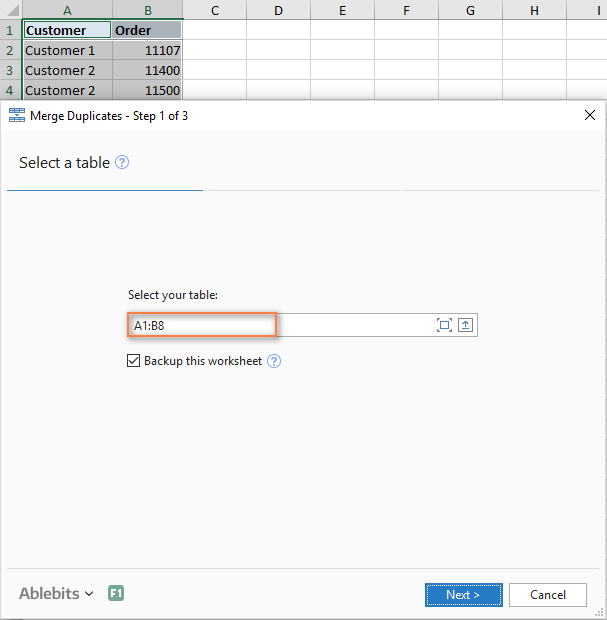 Hi I am interesting in doing exactly the example given in "Merge matching rows from 2 Excel worksheets without copying / pasting" (https://www.ablebits.com/office-addins-blog/2014/02/06/merge-rows-excel/#merge-matching-rows). to be brief: Product, Jan sales on 1 sheet and Product, Feb sales on another sheet. 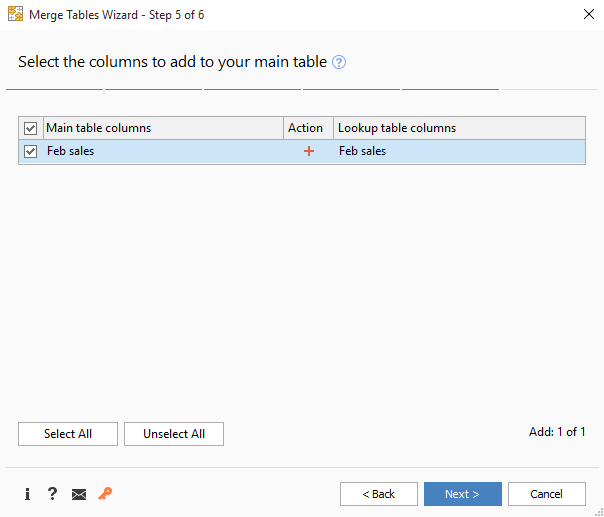 I download the "merge two tables" function but I do not ended up with Product, Jan sales, Feb sales as described. Step4 is actually different. So I am wondering if you guys have updated this function and more important How to do the example because it is exactly what I am looking for? Choose the necessary additional options on the last step and click Finish to get the desired result. how can I have Ablebits in my Excel? If this add-in actually does what it says, I'll most probably purchase it, but I tried the trial version to combine rows and delete duplicates in them but it did not work. I went exactly according to the tutorial above but still it didn't work. After pressing finish, a message comes which says 0 Rows combined, no duplicates found, I don't know what is the problem. Can someone help me with it? I'm sorry to hear that. Would it be possible for you to describe your task and send a sample spreadsheet to support@ablebits.com? Please also include a link to the post and your comment number. We'll look into this issue. I have a list of contacts to merge. Some rows are for the same person, and have different data than the other rows. One may have an email address, the other the phone number. Sometimes both rows have the same data. The prior comments are all interesting, but did not have this answer. Is there a way to merge the rows and retain the best data? I would think I need a VBA macro which allows a dialog box for me to choose the better of the two data points if there is competing data for a column. This may not be a strictly Excel solution, but do you have any advice for this very common scenario? 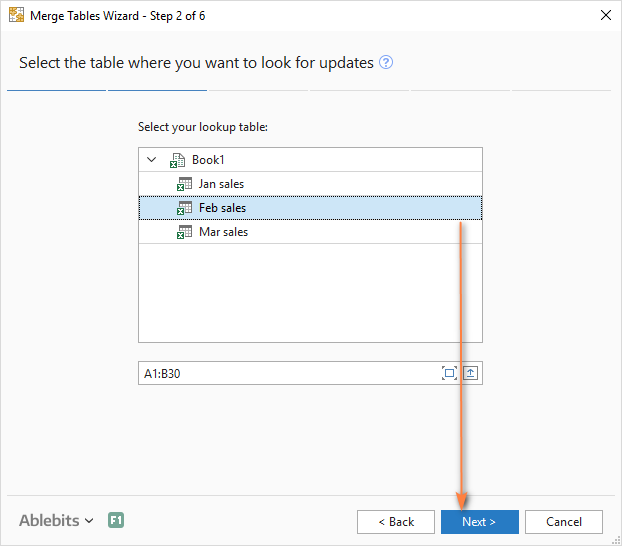 You can specify the key columns to know the rows refer to the same record, like the name, and select all other columns for the merge with the option to delete duplicate values; thus you'll get all relevant information on the same row. I have two rows, 3 columns with Col A Name, Col B expiration date and Col C email address. Is there a function in Excel which allows a user simply combine two sheets finding the unique data identifier in both sheets and automatically add the necessary number of additional columns so that all of the data in both sheets would be displayed on the line where the unique identifier is found on each sheet? Seems like there would be a function in Excel to do this easily and automatically without entering any formula. I have alpbhabets in column A and Assigned values on column B.If I merged some albhabetic letters in C.I need to display the corresponding mergerd values in column D.Is this Poosible?If Yes How? a 1 ac 13 ..................? I need to merge multiple rows in the same column with one another so that you have all text in one column, and row. Can you please help? 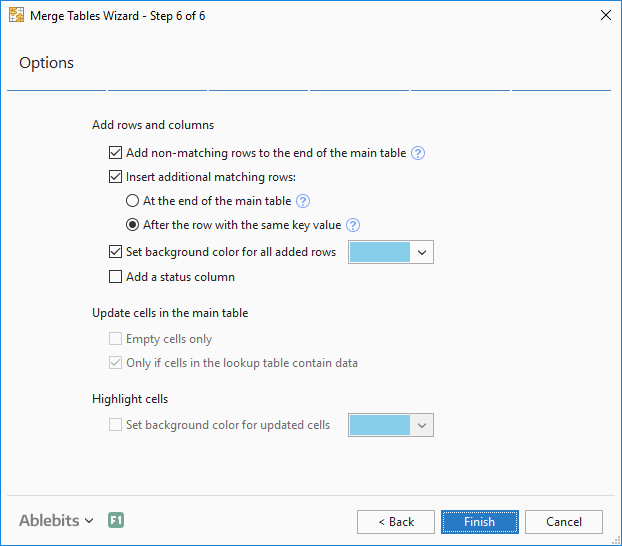 we have just a perfect solution for you - Merge Cells Wizard. 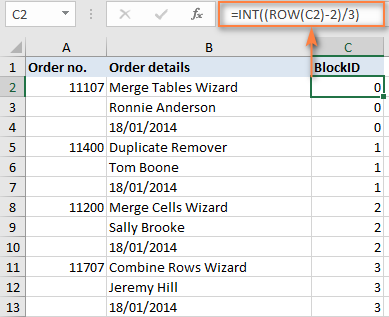 With its help, you'll be able to combine multiple cells into one cell/row/column and use any separator to your liking. You can download and install the trial version of the add-in by using this direct link. Please find the instructions on how to work with the add-in on its help page. Hope you'll find the add-in useful! is there a short way l could merge rows with even gaps into one row. l am using a sheet with several line items which have different row gaps. 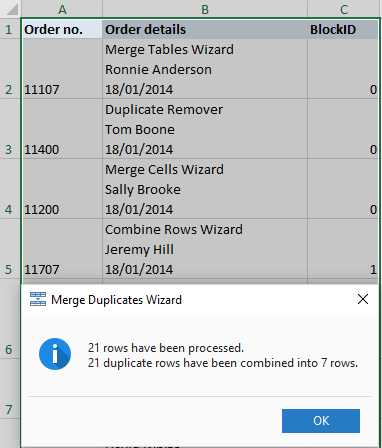 the simplest and quickest way of combining the rows is using our add-ins: Merge Cells and Combine Rows Wizard. You can see how they work in the article above and you can also download and install their fully-functional versions to try them out. I need help if i have data in multiple row and i want to combine into multiple column, is it possible in excel? Dear Sir/Mam, How to count the number of rows in merged cells by using formula and not by VBA. For Example, If range A1:A10 is merged then how to get the number of merged rows (i.e. 10) in this range by using only the formula. this article is useful......is there any index so that i can search through the blog?? Hi there my question is slightly different. So I need to remove the blank lines between the writing but keep the writing on separate lines. I have a lot of contact information -- the same person is listed in six rows: one of the rows has a phone number but no email, another has an email but no phone. How do I remove the duplicates and keep the phone number and email address in the final unique entry?